HorseLife defines what it is to love horses and how that appreciation influences everyday life. You may not own a horse or even live close to one, but anyone who has taken the reins before knows the transcendent calm that comes from something as simple as watching the setting sun on horseback or a nuzzling velvet nose on your palm when you return to the stable. 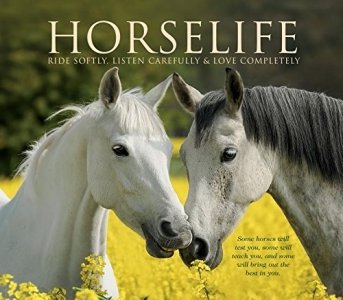 Artful photography and heartfelt passages make this book the perfect gift for the horse lover in your herd. Ride softly, listen carefully & love completely. Some horses will test you, some will teach you, and some will bring out the best in you.